Hello! I am back today to share another super sweet card! This time featuring Newton! Or Newton colored to represent one of my kitties, Storm. My original plan for this card was to use an ink smooshed background with the colors used in the balloons. But when I put it all together, it all felt too busy. So I swapped the background out for a bold patterned paper that coordinated well with the balloons! The stamp sets I used for this card are Newton's Birthday Bash and Newton's Birthday Flutter for the balloons. I did a bit of watercoloring with distress inks on my images, using Black Soot for the kitty, Chipped Sapphire, Pine Needles, Broken China, and Fossilized Amber on the presents and balloons. While those were drying, I worked on the focal panel for the whole scene. I created a cut file in my Silhouette and repeated the Happy sentiment 3 times down the center. Once that was cut out, I used a stitched rectangle die to trim it to the size I wanted. Then framed it with a scallop cut vellum rectangle. 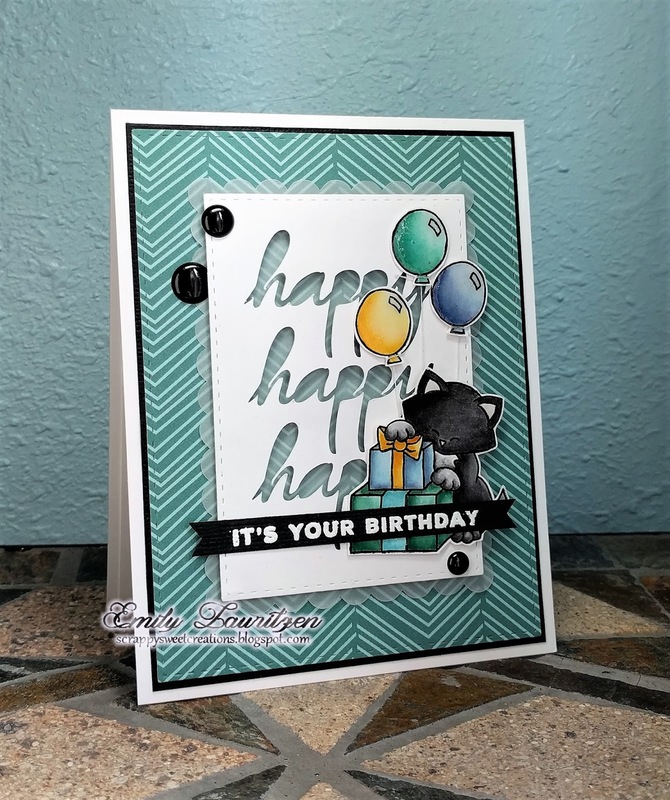 I foam mounted that onto my card base, and then added all my fun little elements along with a few black enamel dots. Indeed a super cute card ! This is adorsble. Love the negative die sentiment. Love the colors on your card. Your storm colored kitty is adorable!